What’s on your bucket list? Perhaps sky diving, snorkeling the great barrier reef? A bungee jump? One of the things on my list was to watch Real Madrid play at the Santiago Bernabéu. This month I got to tick this off my list. 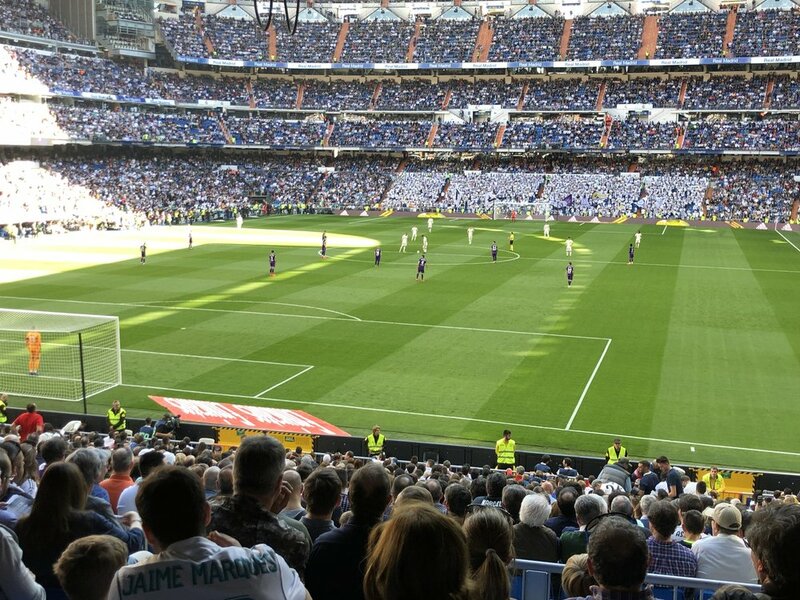 I went with a friend and it was all I’d ever hoped it would be, the atmosphere, the noise, listening to 65,000 Madrid mad supporters roar on their team to a 2-0 victory against Celta Vigo - just priceless! Just about to kick off. Although the football was always going to be the highlight of the trip we did a lot more than just go to the game. We ate and drank lots of amazing food and drink, did some sightseeing and walked all over Madrid. We stayed in the north of the city at the Barcelo Imagine hotel, a short 15 minute taxi ride from the airport and nearby to the Charmartin railway station, it’s a lovely hotel with a rooftop terrace, and lovely quiet courtyard and pool for lazy hours soaking up the sun. In between the sightseeing we’d spend an hour or so down here enjoying the warmth whilst enjoying a cold beer. Barcelo Imagine - A modern hotel with a musical twist. Including a replica floor keyboard from the Tom Hanks movie Big. 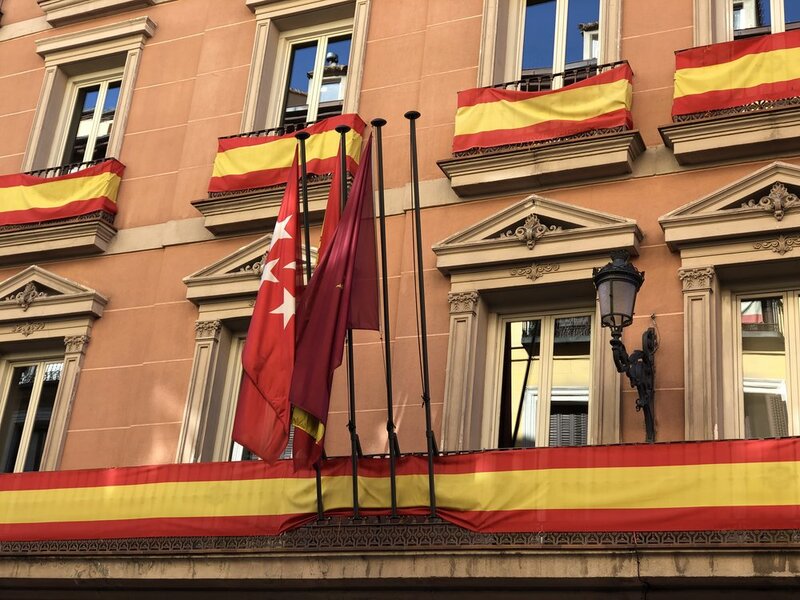 One of the colourful government buildings in Madrid. 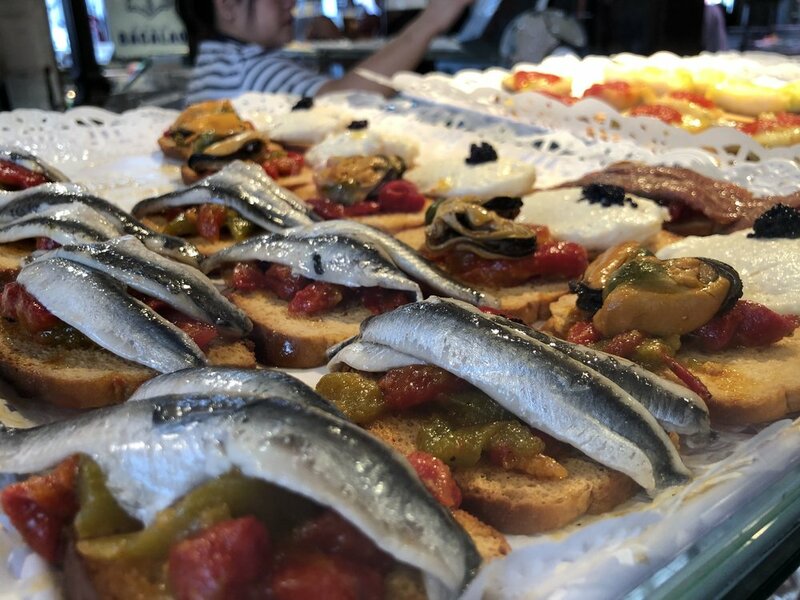 One of the places that amazed us most was the Mercado De San Miguel a famous market that is now a listed world heritage site offering gourmet tapas. We spent over an hour walking around this small iron structure sampling the best food Spain had to offer. Some of the tapas available at Mercado de San Miguel. Wide variety of ham, sausages, salami’s and all things meaty. The food was way above the standard of normal street food and some of the finer things on offer were oysters, caviar & wafer thin Iberico ham carved on the bone. It’s the type of place you could spend most of the day in and not get bored. Unfortunately with a limited amount of time on our hands we did have to leave to see more of the city. Another of the many sights we saw over the weekend was the Catedral De Santa Maria La Real De La Almudena a Catholic Cathedral original built in 1879. It features many amazing stain glass windows, paintings, and is stunningly beautiful throughout. The cathedral in Madrid is a must for every visitor to the city. After all the sightseeing we stopped off for some food, and ended up in a restaurant called Steak Burger, anybody who reads this blog regularly will know about my love of burgers. It was possibly the greatest ever burger I’ve eaten. Steak Burger filled with melted cheese. Another hidden gem for food was Jimbo Smokehouse, a good mile or so outside of central Madrid and tucked down a side street most tourists wouldn’t know it existed. The barbeque food on offer at Jimbo’s is phenomenal and at the risk of upsetting our friends at Red’s BBQ in Nottingham, possibly the best brisket we’ve tried. It was that good we didn’t even think about taking a picture. I loved Madrid and it’s relaxed pace and atmosphere suited me perfectly and it’s certainly a city I’ll go back to in the future.